It's Day One of Visions of Sugarplums! So glad you've come by. Settle in - this is a long post, maybe get a coffee or tea, and enjoy! We've got quite a line up of talented bloggers sharing Christmas inspiration! First up, I've got the cutest Christmas Wreath! Isn't this fun - it's made from a mason jar ring and crepe paper. It reminds me of projects we did in grade school - wrapping crepe paper around the eraser end of the pencil to make the "poofs." And that's exactly what I did! You could use this as package decoration that the recipient could take off and hang on their tree. Or like me, hang it on a desk drawer. Love, love that sweet little deer! Next up: the most adorable vintage Scotties! I was lucky enough to pick up this cute vintage card from an etsy store. You can download the scotties below. I've also got a darling Scotty tag (he was on the inside of the card) and a very cool box for you to download. The papers are fabulous! I found them at Yellow Lemon Studios. The box would be perfect for a gift card or small gift and a sweet note. You can download the tag and box below. Can you think of someone who would love to get this cute little box? I'll have one more project with these Scotties next Sunday - on the day we reveal all the winners for this year's Visions of Sugarplums! Okay, one more project for today. I am so in love with this card. Those kids looking out the window at Santa are the cutest things ever! You can download these darling kids below. And the card itself is very cool. It's a sliding easel card. Look at it from the side - love how this works! This is a look at the part that you pull to make the easel fold up. So fun! 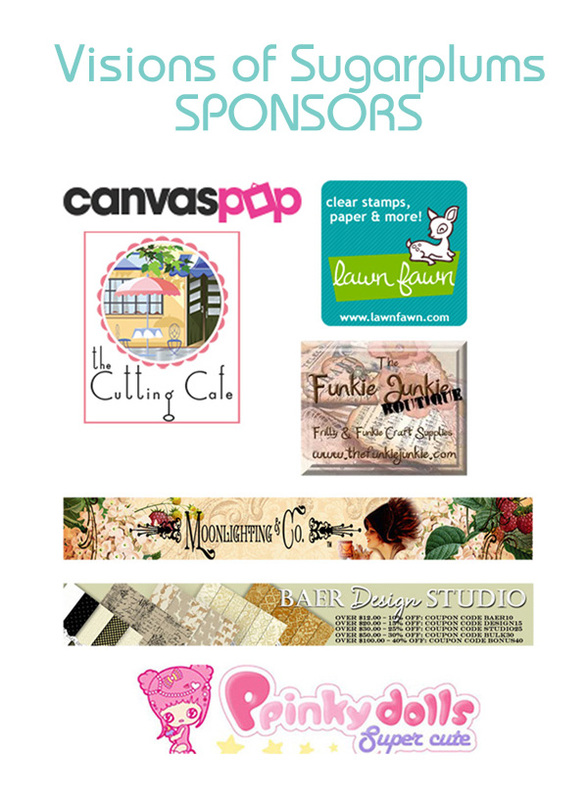 Let's talk a minute about our Sponsors for this year! They are awesome and generous! 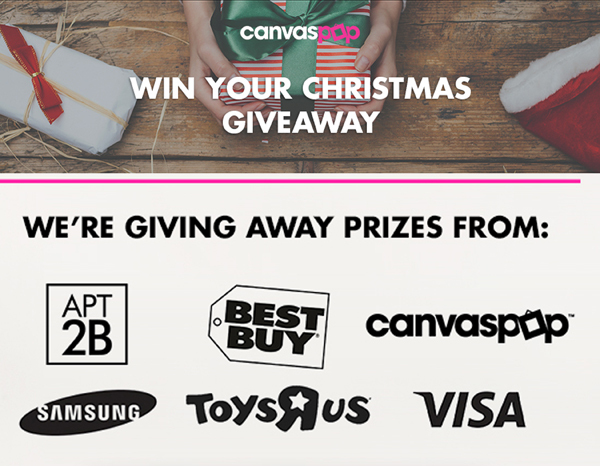 Canvas Pop has another great giveaway going on right now - you could WIN YOUR CHRISTMAS! Enter by December 11th. Enter the WIN YOUR CHRISTMAS giveaway HERE. I'll show a picture of my giveaway tomorrow! How do you win? Easy! Comment, comment, comment! Comment here on my blog and then comment on all the other blogger's posts, too. For every comment you make during Visions of Sugarplums, I'll add your name for a chance to win one of our prizes. All winners will be randomly chosen and announced on Sunday, December 13th. 1. Download the Scotty Vintage Card HERE. 2. Download the Scotty Tags HERE. 3. 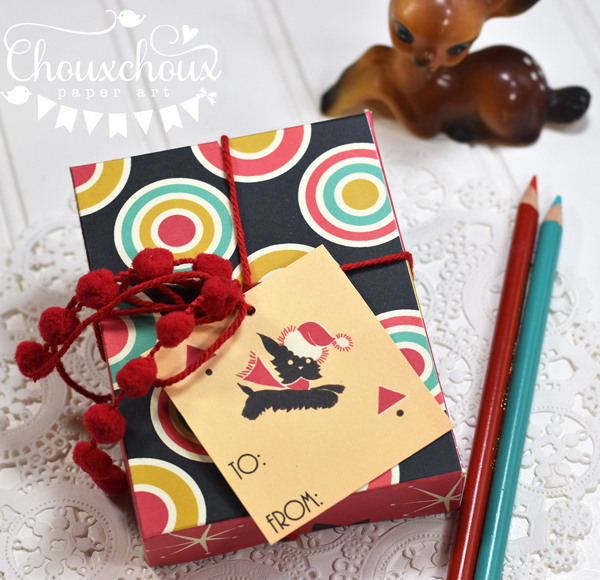 Download the Retro Christmas box HERE. 4. 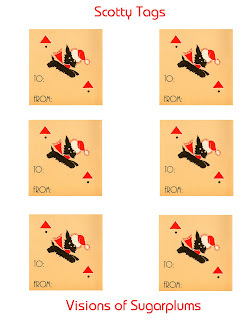 Download the Christmas Kids HERE. 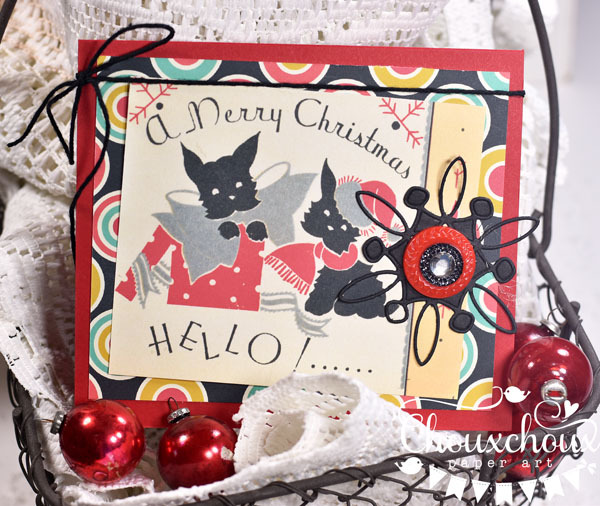 One more announcement: Link up to the Visions of Sugarplums Christmas/Winter Challenge! You can find it HERE. See you tomorrow for more Christmas goodness! Well good morning and THANK YOU to you. That bombardment of vintage wonder was fabulous. LOVE your mason ring wreath, your Scottie images and those precious children. Your slider card added so much to that image and how you really grounded it into the card by adding the wreath and tree looks wonderful! Thanks for kicking off day with such amazing inspiration! Wow, all your creations are beautiful and a lot of work put into them. I luv the very elegant wreath, and made with a mason ring, and to think I only canned with them. 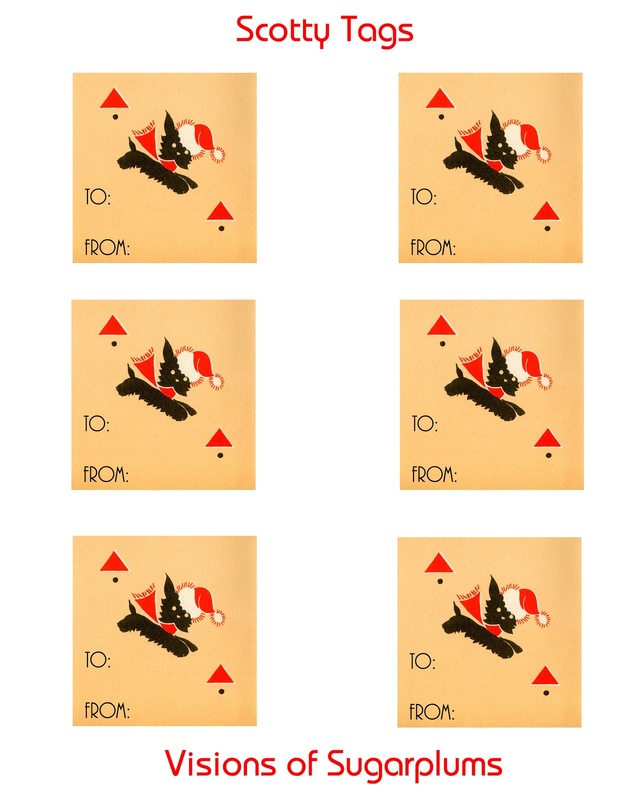 And the sliding easel card is so adorable with the children watching Santa on a neighbors roof. Great inspiration. Oh my...I just love everything! 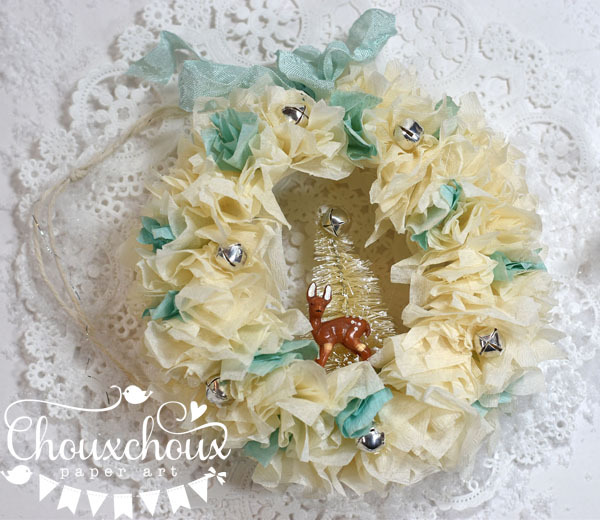 That wreath is so pretty...definitely want to make one or more of those! (I just bought a deer like that yesterday! (I have a jar or shadow box project in mind for it...lol...I can't decide...and the Scotty....adorable...and the kids ... More adorable! That easel card is so pretty! Planning on hopping along and taking the challenge. Thanks for the fun and freebies and chance to win prizes.....my day is set! Thoroughly enjoyed the hop! So much inspiration... now back to work!! such sweet projects! I love it all! that wreath is so sweet! I love the colors and it could be used for so many things. I have rusty rings I have saved that we can no longer use for canning, so this would be a perfect way to use them. I love the card too. Oh my! So glad you made it into an easel as it needs to be set out to enjoy all season long. thank you for the freebies and thank you for letting me play along this year. I am having a blast and have been so inspired by everyone's posts. Can't wait til tomorrow! OH dear good gracious. The inspiration on this hop is just absolutely astounding. Truly talented peeps! LOVE! Awe...that's my response to your amazing projects today! The wreath is stunning; the scotties, darling (I'd love to have a real scotty! ), the easel card, fantastic. WOW...Day 1 and you've already taken my breath away! wow... you are so creative and clever!! the wreath is gorgeous (and yes... I remember making those little "poofs" in elementary school!) as are the other projects! thank you for sharing your talent with us!! Oh, my!!! 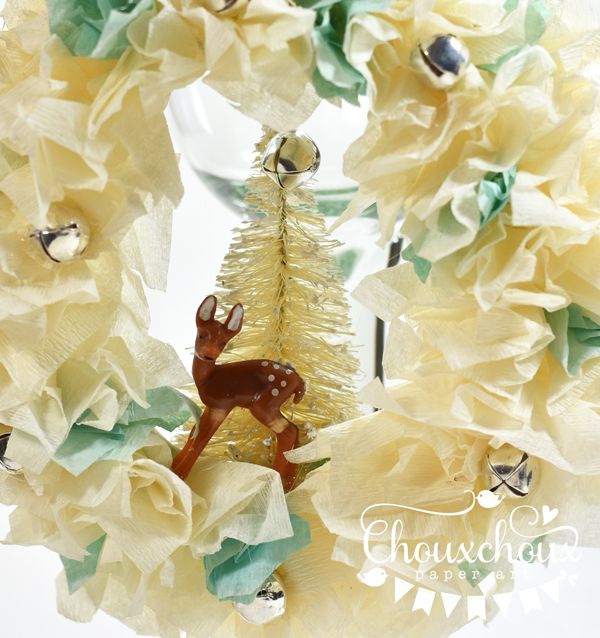 Your wreath is so gorgeous, Lori! And, love the darling scotty projects! Awesome slider card with the sweet children, too! What an awesome hop...so fun...and filled with over the top projects! So happy to be a part of it...thank you!!! Wow, all of your projects are fabulous!! I really love the wreath!! They are all so beautiful!! Wow, Lori! All 3 of your projects are amazing! I enjoyed the tutorial videos very much! The wreath really caught my eye and I love how easy it looks! 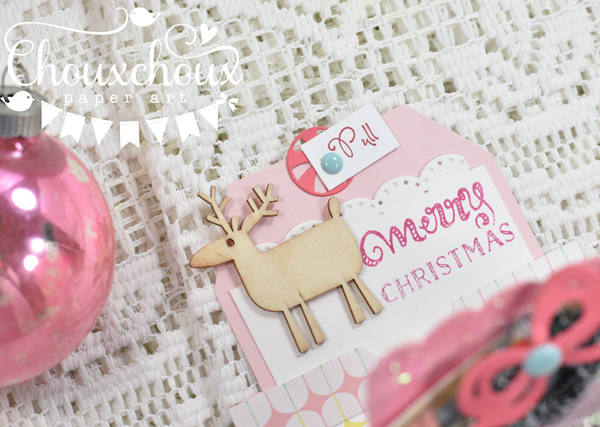 The little gift box and Scottie tag are adorable - thank you for the cute downloads! Also your easel card is so cool - I don't think I've seen one like this before! Leave it to you to invent a new card style! I will be hopping around to see everyone else's projects! Thanks for a fun event - I am excited about the inspiration! I'm just getting a bit of my mojo back and I'm ready to be inspired! Great projects Lori. I love the wreath!! My son made big Christmas wreaths in school when he was a little boy. I have never made one, but I will this year, so thanks for the instructions. 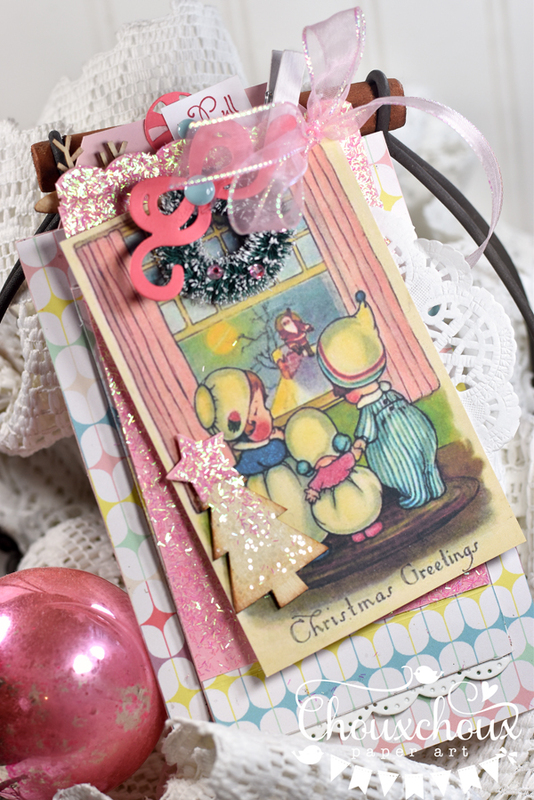 :-) Been looking forward to the Visions of Sugarplums blog hop!! Oh my Goodness, beautiful creations! I just love the wreath and will find time in the next few days to watch them all!! Thank You for all the inspiration my friend! Every project is such an awesome inspiration!!! Loooved the wreath! Will be making one as well for xmas! wow--loving it all--again! that wreath is amazing! Thank you for sharing. Just watching the video took me back to grade school and making presents for my mom. Such gorgeous & stunning projects! 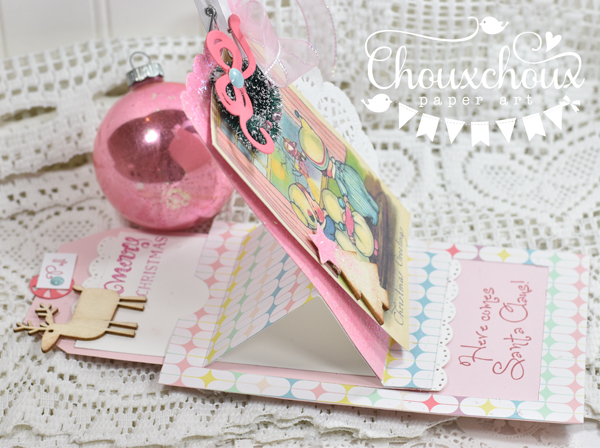 I love the adorable sliding easel card!! So cute and thank you for the videos!!! Merry Christmas!!! Amazing start to your event! I LOVE LOVE LOVE all the beautiful designs, but that wreath has me smitten. Yes.. it does remind me of something from my childhood - and now I need to make one!! Thanks so much for inviting me to play along this year... I'm in awe and honored to be here! Beautiful projects! Wreath is awesome!!! Thanks for the inspiration and videos. The wreath is amazing & I so love your last card!